Welcome To Jordan From The Depth Of My Heart. In the deepest gratitude from my heart to yours. intrigue. All are welcome in Jordan.The warm welcome extended to our many friends from around the world is as ancient as the human travel itself. Today the people of Jordan cordially invite you to explore the many unique and wondrous gifts of the Kingdom of Jordan, invaluable gifts of historical knowledge, cultural discovery, and spiritual enrichment. All eagerly waiting your arrival to Jordan. Jordan is a place where Christianity and Islam meet. As it is filled with various Christian religious sites, Jordan is also filled with many Islamic ones. In fact, did you know that Jordanian land was the first territory outside of the Arabian Peninsula to which Islamic spread. This site is a none profit site, no company, or otherwise is behind it. This site has been created as a gift to the Jordanian people to use as an information source for tourism. 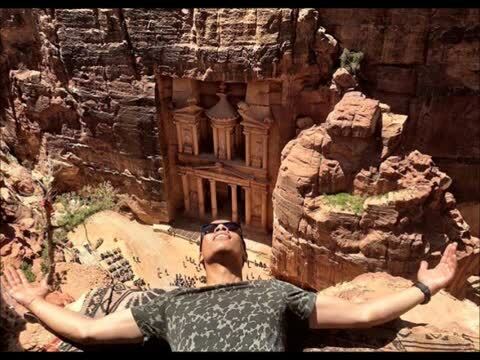 This site also has been created for the people that visit Jordan to express the great adventures and experience you had in Jordan. Helping the world to see that Jordan is a place of Love, Peace and beauty. Throughout this site you will experience the magic of Jordan with Jordanian traditional music on each page, to feel and experience Jordan in its fullness. There is no contact for this site, Australian & Jordanian Sponsors wishes to be unknown.